Enjoy, Dear Reader! And as always, I welcome your thoughts. -Letter from Alexander Graham Bell to Charles Benedict Davenport, Dec. 27, 1912. –C.R. Barns at the 11th Convention of the National Association of the Deaf, 1916. In a paper presented to the National Academy of Sciences on November 13, 1883, Alexander Graham Bell (1847-1922) provided statistical evidence to support the claim that if the laws of heredity hold suit, then “the intermarriage of congenital deaf-mutes through a number of successive generations should result in the formation of a deaf variety of the human race.” By examining records of institutions for the deaf across America, Bell found deaf intermarriages “to be not the exception but the rule,” and insisted proper remedial measures were needed to “lessen or check this tendency.” Published as Memoir upon the Foundation of a Deaf Variety of the Human Race (1884), Bell’s paper became the exemplar of hereditary statistics for American eugenicists in the Progressive Era. Tying Bell’s work on eugenics and oralism is therefore significant for understanding not only Bell’s personal views on eugenical measures, but also the intertwining of ideas about hereditary deafness and eugenics in twentieth century America. Bell felt a natural sympathy for the isolation of the deaf. Inspired by the success of oralism—the use of speech and lip-reading over sign language as primary communication—in his mother and wife, Bell years striving to significantly transform the public perception of the deaf in America. While scholars of deaf history have long recognized the influence of eugenics in Bell’s thoughts, to a large extent, the literature on Bell in general (or “mainstream”) history and deaf history has been kept separate, without much overlapping in arguments or uses of sources. Despite his eugenical work and prominent positions in the American Breeders’ Association Committee on Eugenics and the Eugenics Record Office, Bell’s role has been significantly undermined in the history of the American eugenics movement. Brian Greenwald’s dissertation is the most comprehensive discourse on the dual image of Bell as an educator of the deaf and as an eugenicist. Greenwald argues that while Bell’s views on eugenics and his alliance with various eugenicists were in conflict with his personal familiarity with the basic humanity of deaf people, Bell nonetheless served as an “effective buffer” between the scientific and deaf communities. In doing so, Bell protected the deaf community from the full force of harsh eugenics measures, including legislation restricting marriage, and sterilization, even while weakening the community through his advocacy of oralism. In Memoir, Bell explains his paternalistic stance: “[m]any people have the idea that [the deaf] are dangerous, morse, [sic] ill-tempered, &c. Then again people do not understand the mental condition of a person who cannot speak and who thinks in gestures. He is sometimes looked upon as a sort of monstrosity to be stared at and avoided” (Bell’s emphasis). Normalization through oralism could spare the deaf from further mistreatment from the hearing society. The two chief interests of Bell’s life, education and eugenics, merged together over the issue of deaf intermarriage. While the eugenics movement’s main aim was to translate science into public policy, Bell turned to eugenics to enforce and further his educational approaches for the deaf. In this paper I argue that oralism served two of Bell’s agendas for integrating the deaf into hearing society and reducing the likelihood for a “deaf variety.” First, by subscribing to ideas of heredity of his time, Bell saw in oralism an opportunity to “normalize” the deaf by removing them from their isolation from society as well as from the “instinctive prejudices” of hearing society. As Robert Bruce explains, this “needless isolation of the deaf touched [Bell’s] compassion and sense of justice,” and thus Bell turned to eugenics as a means for breaking down that isolation. Secondly, through his eugenics gaze, Bell’s research aimed to reinforce a certain conceptualization of deaf people, one which relied on what Harlan Lane refers as “technologies of normalization:” procedures and technologies that reify socially rejected differences as a treatable biological condition. In Bell’s case, oralism and eugenics both served this purpose, by removing from the deaf barriers to their integration—sign language, residential schools, associations, and the like—and replacing with guises of “normal” behaviour, such as speech and lip-reading, thus rendering the deaf different from other “undesirables” categorized by eugenicists. Bell thus relied on oralism as an alternative to sterilization and restrictive legislation measures championed by negatives eugenicists in the likes of Harry Hamilton Laughlin (1880-1945). Therefore, for Bell, oralism would allow for the “healthy integration” of the deaf into society and the decline of the “deaf variety” of the human race. A.G. Bell, Memoir upon the formation of a Deaf variety of the Human race (1884), p.4. F. Galton, “Eugenics: Its Definition, Scope, and Aims,” The American Journal of Sociology 10 (1904): 1. N. Ordover, American Eugenics: Race, Queer Anatomy, and the Science of Nationalism (Minneapolis: University of Minnesota Press, 2003), p.7. M. Haller, Eugenics: Hereditarian Attitudes in American Thought (New York: Rutgers University Press, 1963; D.J. Kevles, In the Name of Eugenics: Genetics and the Uses of Human Heredity (London & Cambridge: Harvard University Press, 1995). Haller describes the movement in three stages: the “Preparation Period” from 1870 to 1905, the “Influential Period,” from 1905 to 1930, and the “Downhill Period,” which occurred after the 1930s with the emergence of the Nazi association with eugenics. Besides a few other books on the general history of American eugenics, there have been some articles and books meticulously examining specific issues that arose from the movement. Kenneth Ludmerer’s Genetics and American Society (John Hopkins University Press, 1972) also acknowledges both internal (e.g. revival of Mendelism) and external (e.g. economic unrest) influences contributed to attitudes towards eugenics and the growth of the movement. Steve Selden’s Inheriting Shame: The Story of Eugenics and Racism and America (New York & London: Teachers College Press, 1999) and Nancy Ordover’s American Eugenics: Race, Queer Anatomy and the Science of Nationalism (Minneapolis: University of Minnesota Press, 2003) explore how perceptions of race influenced the direction of America eugenicists. Gerald Allen has also persuasively argued that the fundamental ideas of eugenics were not the product of either the rediscovery of Mendel’s Laws or the Progressive “social movement.” Instead, he presents the eugenics movement within the complexities of moods and tensions of economic and social reform that followed labor and social unrest resulting from periods of economic depression. G. Allen, “Eugenics and American Social History, 1880-1959,” Genome 31 (1989):885-889. L.J. Davis, Enforcing Normalcy: Disability, Deafness and the Body (London & New York: Verso, 1995), p.46. In Silence of the Spheres: The Deaf Experience in the History of Science (Bergin & Garvey, 1994), Harry Lang acknowledges that Bell was a man of scientific inclination whose view of the world was influenced by Darin, while Douglas Banyton criticizes Bell’s Social Darinism, arguing that Bell’s findings were unfounded and based on a faulty understanding of genetics (“‘A Silent Exile on this Earth:’ The Metaphorical Construction of Deafness in the Nineteenth Century,” American Quarterly 44.2 (June 1992): 216-243). In the history of eugenics, on the other hand, Bell is cast to the background of the movement, placed in the shadows of more prominent figures such as Davenport, Laughlin, and David Starr Jordan, though there are a few exceptions. In his meticulously researched War of the Weak (New York: Four Walls Eight Windows, 2003), Edwin Black discusses Bell’s uneasiness with the Eugenics Record Office’s constant focus on negative traits, but Black only glosses over the story and fails to tie Bell’s work as an eugenicist with that of his oralism. Haller has characterized Bell as a respected participant in the movement, but he implies Bell was in favour of legislation interference with deaf intermarriages in evidence for the contrary. Likewise, Charles Rosenberg has also argued Bell was more interested in the science of heredity than the racial ideology associated with eugenics (No Other Gods: on Science and American Social Thought (John Hopkins University Press, 1997)). B.H. Greenwald, “Alexander Graham Bell through the Lens of Eugenics, 1883-1922,” PhD Dissertation, George Washington University, 2006. There is a long list of literature among scholars of Deaf studies and Deaf history over the proper distinction between “deaf” and “Deaf.” While “deaf” commonly refers to any individual with a degree of hearing loss, the use of capital-D has come to signify individuals who have forged with the deaf community and identify themselves with sign-language and are thus culturally distinct from the rest of society (what scholars of deaf history call “mainstream” society). However, the recognition—and acceptance—of a separate and distinct deaf culture that became Deaf culture did not arise until the 1960s and 1970s with the acceptance and integration of American Sign Language. Thus, in keeping with proper historical terminology, unless otherwise directly quoted from sources, I will be using “deaf” or “deaf-mutes” to refer to all aspects of deaf community, culture, and individuals, whether or not they identified themselves as a separate cultural group. R.V. 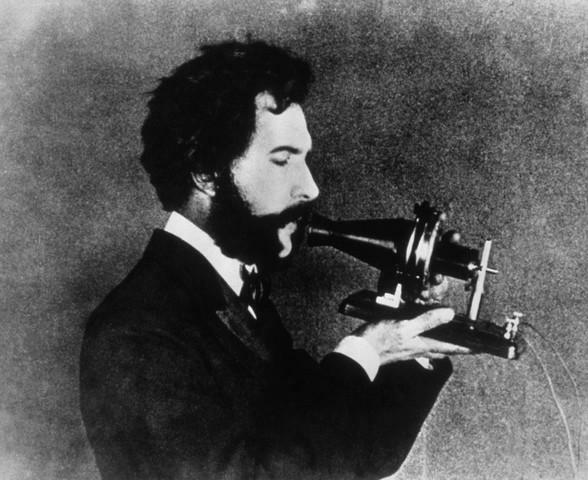 Bruce, Bell: Alexander Graham Bell and the Conquest for Solitude (Boston: Little, Brown and Company, 1973), p.379. H. Lane, “Do Deaf People have a Disability?” in Open Your Eyes: Deaf Studies Talking. Eds. H-Dirksen L. Bauman (Minneapolis: University of Minnesota Press, 2002), p.287.